Sesame Prawn toast was one of my favourite side dishes when visiting a Chinese or Thai restaurant and was most definitely something I thought was off the cards for good whilst living without Gluten, but with some fantastic gluten free breads available and a good choice of gluten free Soy Sauce this Sesame Prawn Toast is once again something I can enjoy and I have every confidence that you will too. I used Genius Bread which worked perfectly and Sanchi Gluten Free Soy Sauce. Both are readily available from most supermarkets. 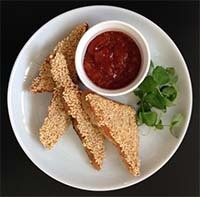 A delicious sesame prawn toast recipe that uses any gluten free bread to give an amazingly tasty prawn toast. Preheat a deep fat fryer to 170c, alternatively add around 500ml of Groundnut oil to a Wok and heat until a small piece of bread bubbles and turns golden brown in around 20 seconds. Spread the mixture onto sliced white bread (I used Genius Gluten Free bread) and then lay face down on a plate covered in the sesame seeds until coated. Fry the Prawn Toast in oil (seed side up) for around 1 minute or until golden brown, then turn over for a further minute to give the sesame seeds a nice golden brown colour. Remove from the fryer and place onto kitchen towel to drain excess oil.